WellAWARE Systems has created a passive monitoring system for older people who may need assistance, but prefer to live independently. 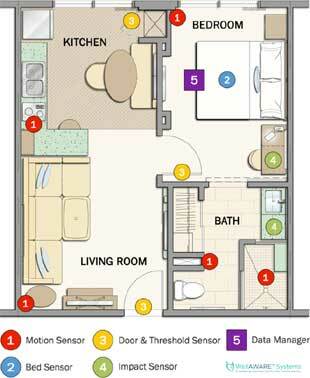 Sensors are placed throughout the living space, with special emphasis on problematic areas. The system readily provides a baseline of activity; caregivers are alerted to any changes in the resident's behavior. Science fiction fans saw this one coming from a long way off. In his 1951 collection of short stories The Illustrated Man, Ray Bradbury writes about a similar kind of system in his classic short story The Veldt. From WellAWARE Systems via ZDNet.